In the morning, we start by going to Angkor Thom city, founded in 12th century by king Jayavarman VII and which remained the capital until the 17th century. Continue to see the Bayon Temple with its 54 towers decorated with more than 200 smiling stone faces, where you can imagine how amazing would it be for the first explorer when there was nothing but trees with umbrella-like branches and other types of creeping vegetation. 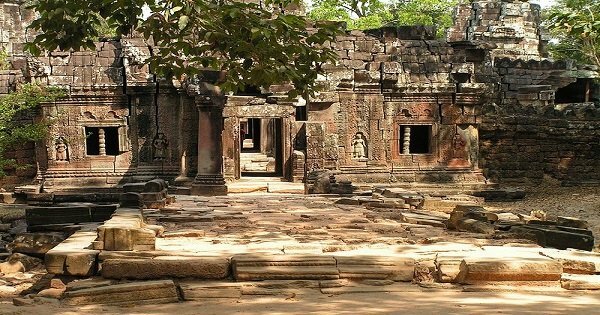 In the afternoon, return to Angkor Thom and visit the beautiful Ta Prohm Temple – made famous by the film Tomb Raider – and imagine yourself as an early explorer as you come upon the temple ruins being reclaimed by the jungle. After having shot hundreds of photographs, we will head to the active pilgrimage site of Angkor Wat, the biggest Hindu temple in the world with the longest carving wall of more than 2000 meters long by 2 meters high, excluding relief on the ceiling and on hundreds of roof supporting pillars. After you have completed the tour around all the most visited temples in the Angkor area, you still have time to admire the whole view of Angkorwat temple, rice paddy, the northeast highland and active reservoir of West Baray. Enjoy some fresh air on the summit of Phnom Bakheng hill till sunset. Pick-up and drop-off from your Siem Reap hotel.